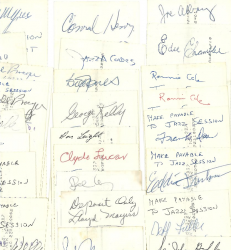 Bundle of 26 checks signed by famous Jazz musicians! Paying by check and banking has changed so much that an old school way to get an autograph from a famous personage by obtaining a cancelled check is somewhat unknown. But going back some years, the bank would send back to the payer, the ORIGINAL check that would have the signature of the payer and the person paid. Here, going back in some cases as much as 40 years and to the heyday of The West End are 26 checks that cleared bearing the signatures of the likes of Joe Albany, Eddie Durham, Russell Procope, Ram Ramirez, and Dicky Wells. Conrad Henry (Lester Young AND(!) Charlie Parker bassist); Sir John Godfrey (once Coleman Hawkins’ drummer); and Eddie Chamblee (tenor with Lionel Hampton and husband of Dinah Washington).